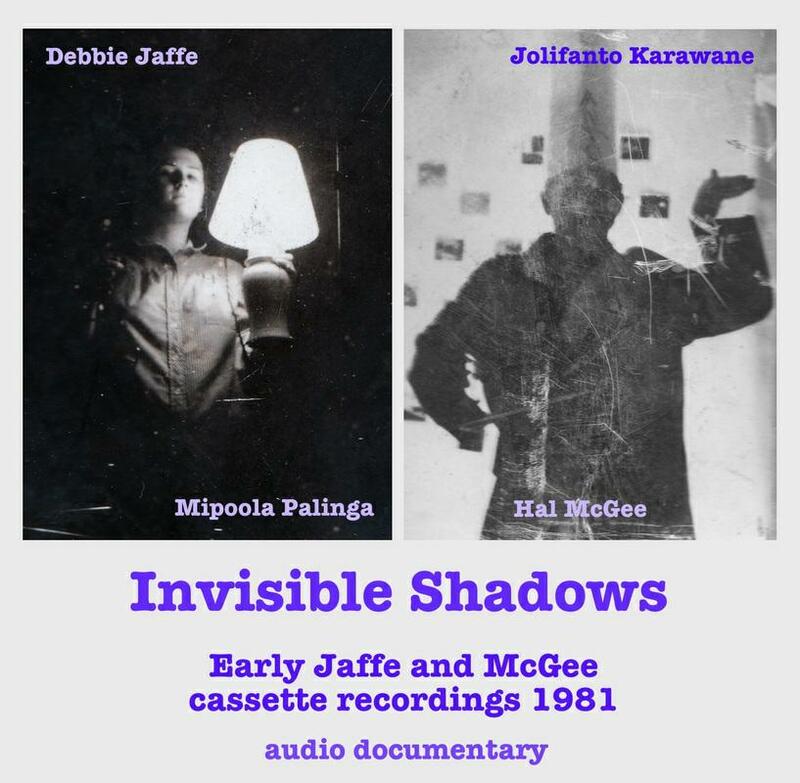 Invisible Shadows is a historical gem for Hal McGee/Debbie Jaffe and homemade music/cassette culture enthusiasts. Work on this document started in late 2014 when Debbie mailed Hal a box of 54 cassettes of raw recordings the duo made between 1981-86, with Hal concentrating on the earliest recordings made with a Panasonic Shoebox recorder. The result is a 2 1/2 hour Audio Documentary of the recordings made in Indianapolis during 1981 when the duo were first budding as experimental music artists. Some of the material was later used on the 1983 released 60 Minutes Of Laughter cassette album, though most have been unheard by anyone except Hal and Debbie until now. Interspersed among the recordings is over 30 minutes of audio commentary by Hal, providing history and context to what we are hearing. Two youths with off the beaten path artistic interests finding a kindred soul in one another and with whom they can spread their creative wings and explore is a big deal when you’re in your early 20s. In the narrative Hal explains: “Debbie and I had absolutely no idea how to make experimental music. We just kind of made out of nothing as we went along, using the simplest of sound sources and sound makers, such as cheap kids bongo drums, a beaten up out of tune acoustic guitar, drum sticks, a harmonica, a gourd shaker, guitar amp, microphone, TV, turntable, common household objects and appliances, poems we had written, found texts and our voices. We resolved to try anything and everything, and to welcome so-called failure as a friend”. The process and experience by which they found their experimental music muse is precisely what these recordings document. It’s important to understand the influence of Dada. In the recently released American Cassette Masters DVD documentary, Debbie describes a family move to Des Moines, Iowa and feeling stuck and isolated until finding the university Dada library where she spent much of her time reading everything she could get her hands on. For his part Hal points to the Beat writers, with emphasis on William Burroughs, who he says has been the single biggest inspiration on his artistic activities, ideas and development. Add to that the Dada that Debbie introduced him to and you have the makings of all the creative rebellion one could hope for. Much of what’s heard on these two CDs would come across as painful caterwauling to those unfamiliar with the larger Hal/Debbie history. And much of it certainly is! But what is striking throughout is the complete lack of inhibition and unbridled fun and joy as the duo experiment and explore in the course of their daily lives. And, indeed, as Hal explains: “Deb and I were trying to cultivate a kind of artistic infantilism, to draw closer to true uninhibited expression. A child’s world is unspoiled by consensus reality and societal conventions and words”. That childlike abandon is conspicuous throughout. Crucially, this is the era before they had acquired any electronic equipment. We’ve got bongo drumming, acoustic guitar and other percussion accompanying various verbal exchanges, some of which seem to combine poetry and oddball Dada vaudeville/showtune songs. There’s frequent laughter and horseplay between free-wheeling exploration and attempts at off-the-cuff creation. If the phone rings… no problem. Answer it and that’s part of the recording. Another highlight is Hal’s commentary about and the performance of their open mic night appearance at a Country & Western bar, which longtime fans will recognize as part of Hal & Debbie lore. The performance and Hal’s description of it, amidst melodic Country Folk-Pop amateurs, is the best part of the entire documentary. Having lived in the South and visited such establishments, to imagine this actually occurring in one of them is both frighteningly mind boggling and rolling on the floor hysterical. The two were living their art. As Hal says, “Debbie and I employed elements of improvisation, chance process, coincidence, randomness and juxtaposition, not only in our artistic works, but in our daily lives as well”. Living his art is something that defines Hal’s life to this day. As he says in The Great American Cassette Masters video when asked how he manages to accomplish so much he reveals, quite simply, that “I have absolutely no other interests in life”. Hal and Debbie went on to found the Cause & Effect label, which was one of the pioneers of 80s cassette culture, releasing audio works by themselves and many other artists from around the globe. Check this out for some genuine fly on the wall insight into their early development.